The first location I visited in the Atherton Tableland, on my way to the Kingfisher Lodge, was Granite Gorge. Near the town of Mareeba in the centre of the Tablelands, I didn’t visit it for birds, but instead to see a representative of that most Australian of animals, the kangaroo. 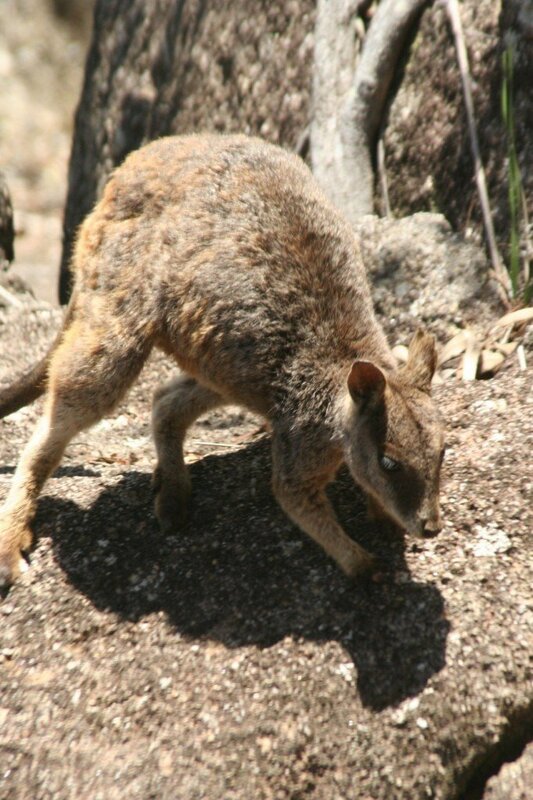 Specifically a wallaby, the Mareeba Rock Wallaby. 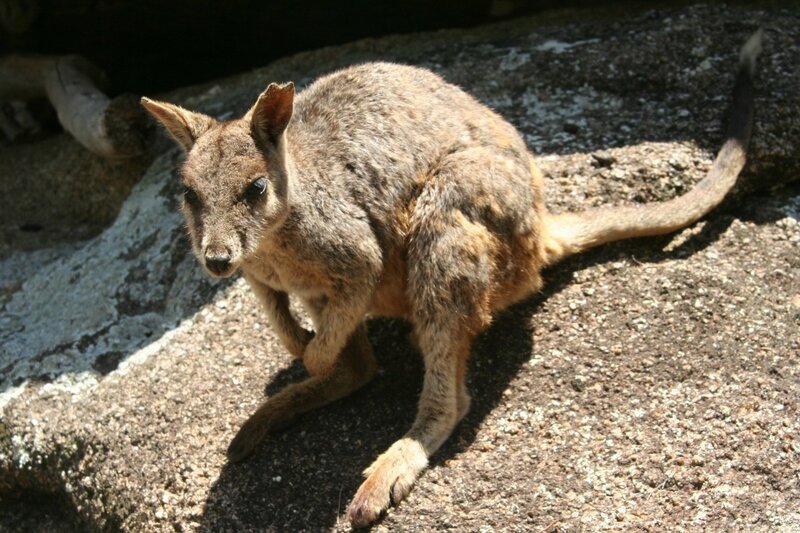 Mareeba Rock Wallaby (Petrogale mareeba). Female front, male behind. 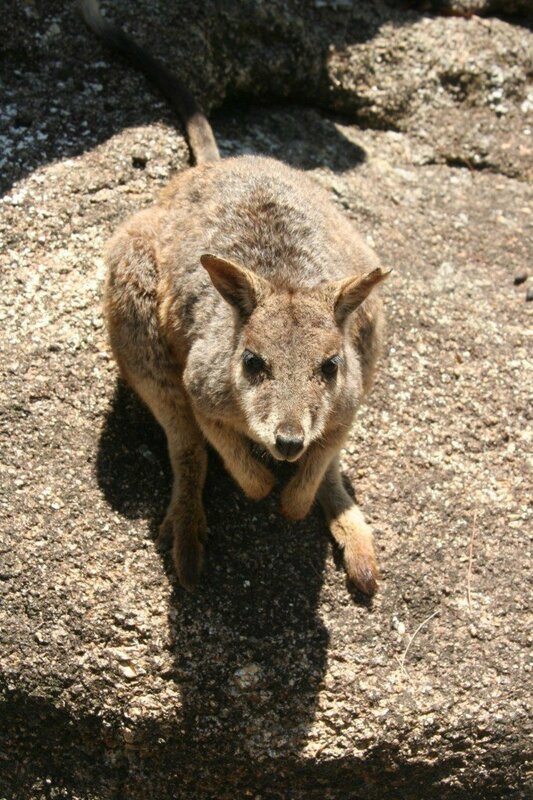 The Mareeba Rock Wallaby is one of a complex of closely related rock wallabies that live in northern Queensland. Like the rest of the group it has a tiny world distribution, patchily occurring in the Atherton Tableland and up to the Daintree. 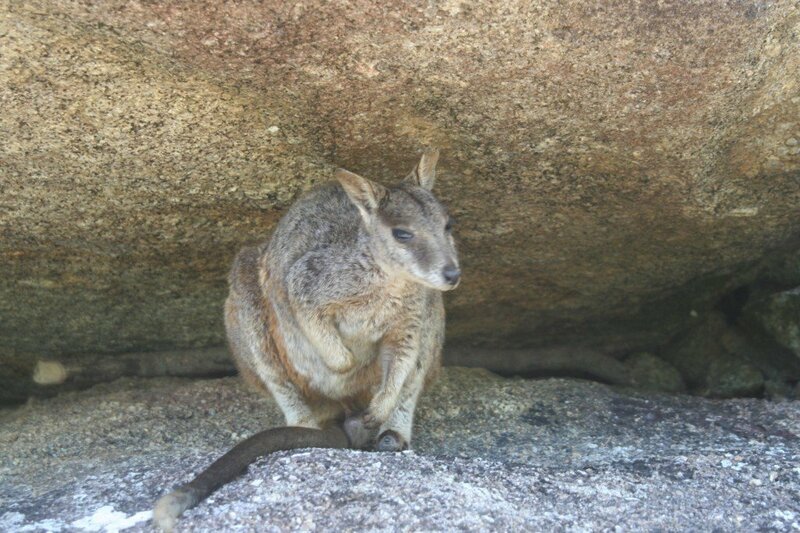 They are medium sized rock-wallabies, weighing around four kilos. 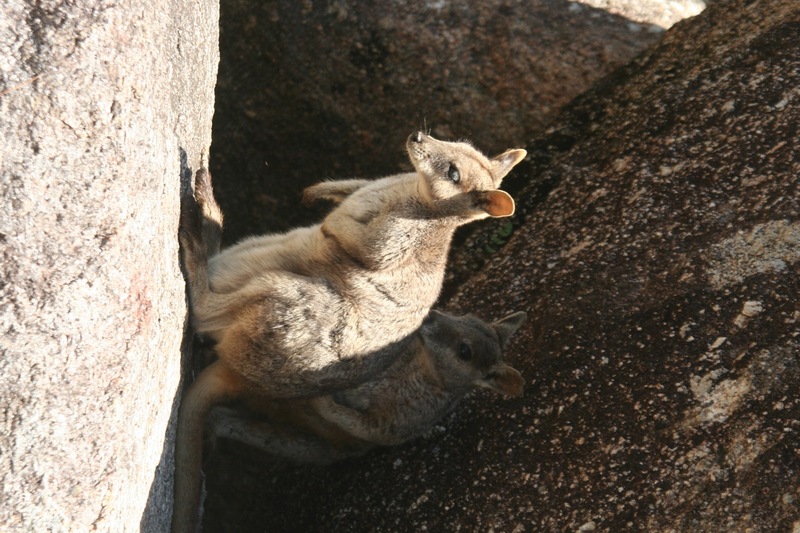 And the best place to see them is Granite Gorge, where feeding has made them exceptionally tame and approachable. 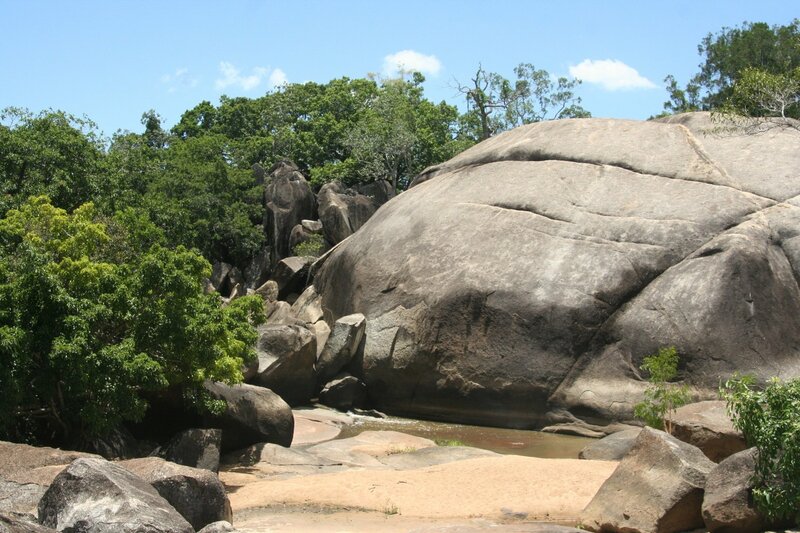 Granite Gorge is a mess of massive boulders and smaller streams winding between them. Perfect rock wallaby habitat. It was around midday when I got there, and the sun was fierce. Not generally the best time to be wandering around the Australian bush in search of animals, but it was a nice time to dip one’s feet in the cool waters of the river that created the gorge. There were not a huge number of birds around, but I did find my lifer Pied Butcherbird, a Laughing Kookaburra, a Whistling Kite far above the trees and what I’m certain was a Great Bowerbird. There was even a Frilled Lizard on the road in, an iconic Australian reptile famous for its extendable frill around its neck. 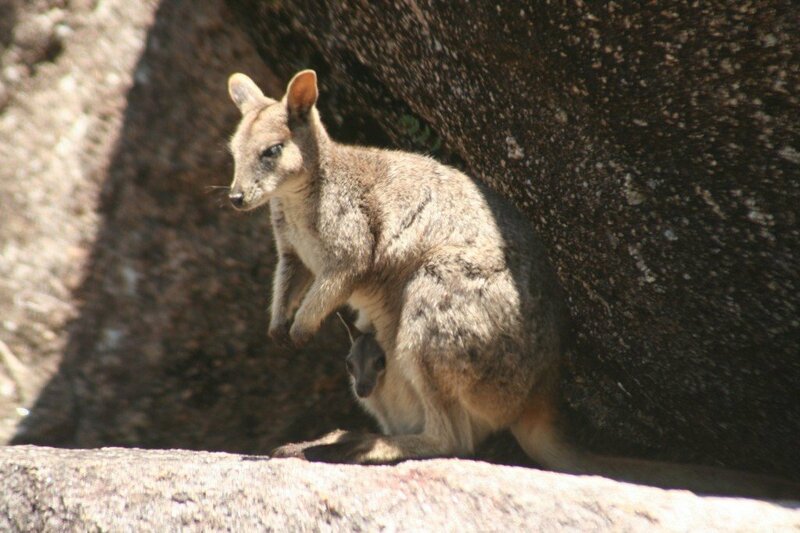 But I was there to see the rock wallabies, and it didn’t take long for me to find them. They were in the shade when I found them, but the expectation of food soon had them coming out to take a look at me. 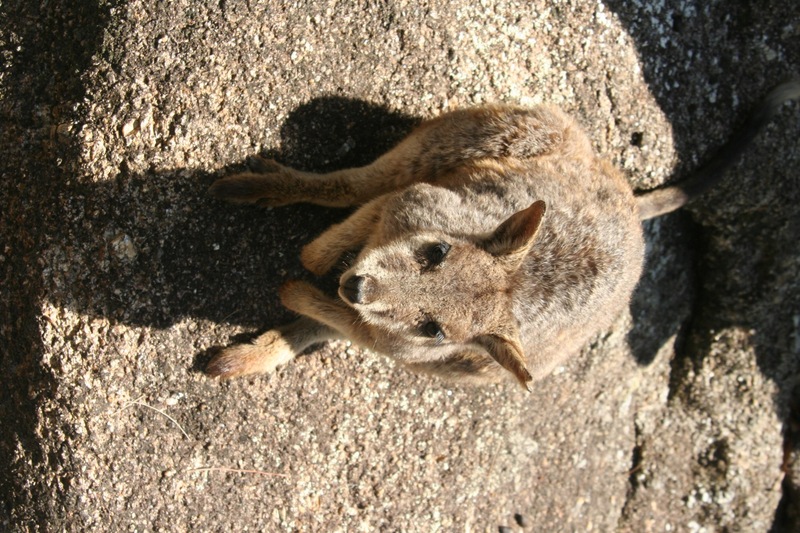 The feet of rock wallabies are relatively short for macropods (kangaroos and wallabies). They are thick, spongy and adapted to gripping rock. 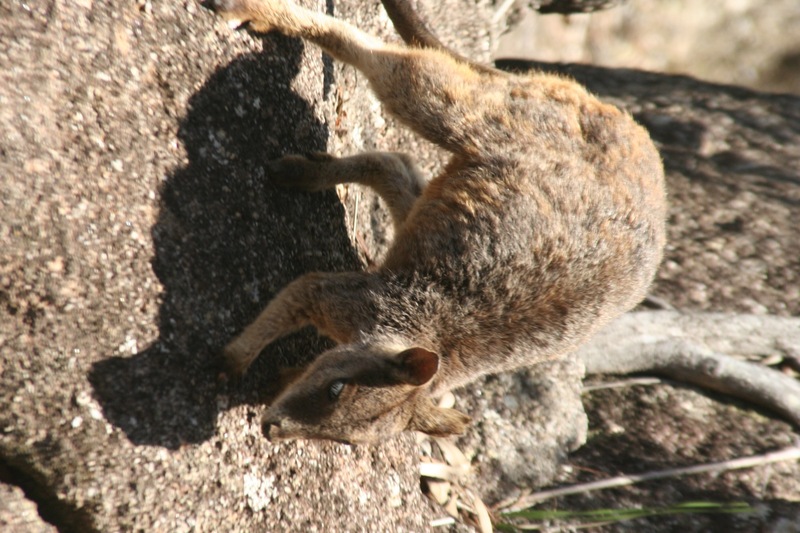 The tail is strong and flexible, and can change the direction of the rock wallaby while in the air. Obligatory shot of the female with a joey! Looking at your various reports from this trip, it’s like you did the exact same tour as me! I’m jealous of your frilled lizard but this area is very good for reptiles. I saw a small water python in the gorge itself and a DOR eastern brown on the road out (not there when I drove in and gutted at the DOR aspect!). Also the only place I was able to find in the area with tawny frogmouths. When I saw the title of the post I was expecting some wallabies playing electric guitar, drums, and bass. Corey, when you get into some of the other species besides Mareeba the rock wallabies present even more eclectic band-naming opportunities. 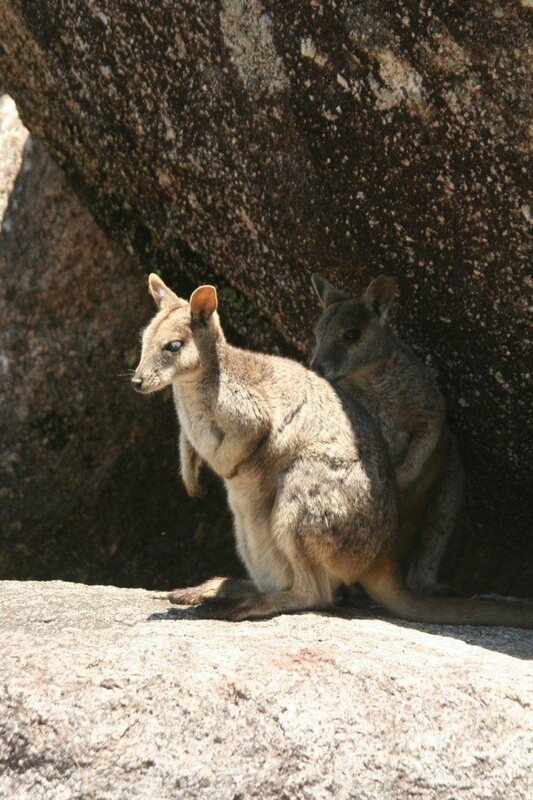 How about “The Unadorned Rock-Wallabies” or “The Allied Rock-Wallabies”? oh my goodness they are so cute!!! they sure are sweet looking little fellas I want one!! I recognize that place. My sister and I went there just over three years ago. I remember seeing a Blue-winged Kookaburra and a White-bellied Cuckoo-Shrike there. Sadly there was a huge downpour while we were there and we had to retreat much earlier than we’d planned to leave.